There are plenty of great, secure men out there. 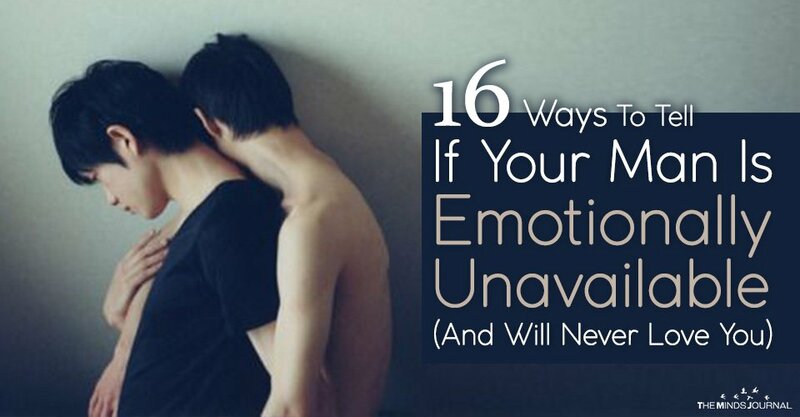 Don’t settle for an emotionally unavailable one. A relationship when both partners are “all-in” is tough enough. But when your man is emotionally unavailable, things are so much harder. You’re committed to making things work, but he just won’t open up. A tell-tale sign of an emotionally unavailable man is a lack of empathy. So check for these signs before you get too committed. 1. He cheats and then blames you. 2. He takes space (more than a day or two) and doesn’t care that it hurts you. 3. He dumps you over and over again, and each time calls to take you back — without concern for your feelings. 4. He shuts down when you act panicky or insecure in the relationship. 5. He isn’t interested in finding ways to soothe your worries. 6. He stonewalls you despite your tears and pleas for his understanding and compassion. 7. He tells you that you are the problem and that if you want to be with him, you have to figure out how to make him love you again. 8. He doesn’t respect your boundaries (emotional or physical). 9. He verbally and emotionally abuses you because he thinks you need to learn. 10. He accuses you of being smothering and mistrusting when you ask him about other women. 11. He explodes when you cry or get emotional. 12. He makes you feel like you’re always the only one apologizing (maybe he even acts victimized for days). 13. He makes you feel like the bad guy and usually, his feelings are the only ones that matter after a fight. 14. He dismisses your feelings, laughs at your feelings and needs, calls you “such a woman” when you are upset, leaves the room, and/or brushes you off. 15. He looks at you with a blank face when you cry to him as if he truly doesn’t understand what’s wrong or what your obvious distress suggests about your emotional state. 16. He makes you feel out of control emotionally, and you’ve never felt that way in previous relationships. Emotionally unavailable men can’t see past their needs and feelings. And women often confuse the sensitive, wounded man with the emotionally available man. But just because a man can easily cry doesn’t mean that he’s compassionate. Sensitivity does not equal empathy. Some emotionally unavailable men are compassionate — they give to charities, they listen to their friends’ problems, they lend money to friends and family members; however, you have to look at a man’s level of compassion for another person’s feelings in moments when he’s upset. You have to look at how he behaves when you are most needy: when your insecurities flare up or when you’re in the midst of a tough circumstance. It’s hard to tend to your partner’s feelings when you are not in a positive emotional state. Most of us quickly get irritated, frustrated and fed up with a loved one who puts emotional demands on us when we feel to-the-brim already.